← Union Jack to get a Face Lift? Today is Constitution Day, the day 227 years ago in 1787 when members of the Constitutional Convention signed the U.S. Constitution. Years later, one American was named or elected to all three branches. Who was he? 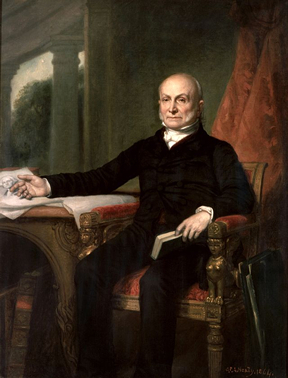 President John Quincy Adams (1825-29) has the distinction of serving in the executive branch and also in the legislative branch both before and after his presidency. He was a U.S. Senator before his presidency and a member of the U.S. House of Representatives after his presidency, the only president to do so. Yet, he also had the opportunity to serve on the U.S. Supreme Court. What happened? In May 1811, while serving as the nation’s top diplomat to Russia, Adams received a letter informing him that President James Madison, with the unanimous consent of the U.S. Senate, had appointed him as a justice on the U.S. Supreme Court. What was his response to the honor? No, but thank you. John Quincy had an obvious reason for saying no. His wife Louisa was six months pregnant and could not safely travel by ship until after the birth of their child in August 1811. She’d already lost two pregnancies while living in Russia and he couldn’t subject her to the perils of ship travel. But voyaging with a newborn would also have been risky for the infant’s health. Hence he turned down the offer, citing both family reasons and a “serious distrust of my qualifications for a seat on the bench” as he wrote Madison. Deep down Adams knew that he wasn’t suited for service on the Supreme Court. Though an attorney, he didn’t uphold traditional interpretations of the role of English common law in the courts, which would have led him to make controversial decisions. After sending President Madison a letter, John Quincy knew he had one more letter to write. He must console his disappointed father, John Adams, the former U.S. president who was living in Quincy, Massachusetts. “I am sorry, very sorry, to disappoint the expectations of my country, by withholding myself from that judgment seat, but happier for me than it would be to disappoint their expectations upon the seat itself,” Adams wrote. Had John Quincy accepted the U.S. Supreme Court position he would have never been president of the United States or a congressman from Massachusetts. This entry was posted in History, Politics and tagged Constitution, Constitution Day, John Quincy Adams, Presidents. Bookmark the permalink.